There’s just something magical about the Lake District, and if you’ve been following Adventure Travel for a while, you’ll know it’s a place that we just can’t seem to get enough of. 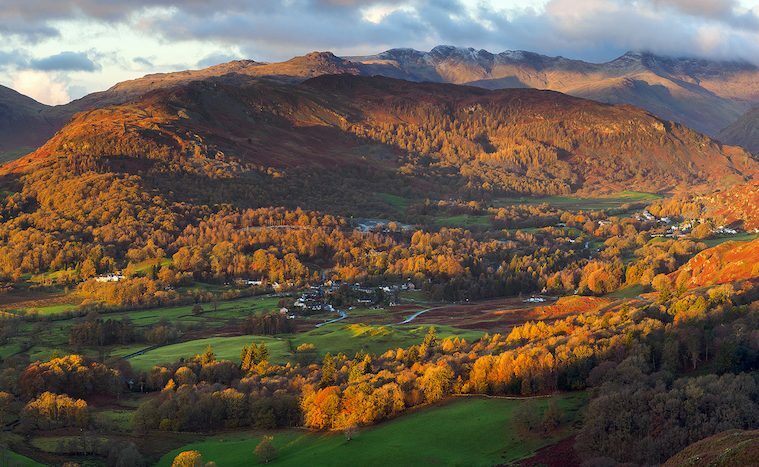 From the mighty heights of Helvellyn to the impressive hilly views from Holme Fell, the Lake District is one of those places that just keeps giving. However, with so many incredible hiking opportunities on offer in the area, it can be an overwhelming task to decide where to start when looking to choose one of the best walks in the Lake District. So, we’ve teamed up with our friends at Vaude to bring you six of the best walks in the Lake District to help narrow things down a bit for you. 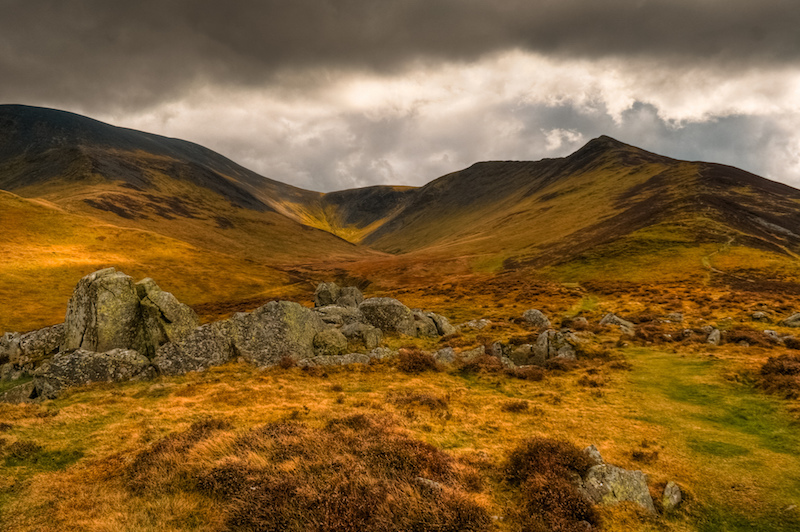 It may not be the highest mountain in England, but towering 931m over the luscious green landscape just north of Keswick, Skiddaw is the sixth highest mountain in England and is a hike that should not be missed in the Lake District. One of the most popular routes to the peak of this stunning mountain is via the Jenkin Hill Bridleway. This route is approximately 10 miles long and will take average hikers around six to seven hours to complete. From the top, you can expect thrilling panoramic views of some of the Lake District’s finest scenery, including the Vale of Derwent and the fells. Set right in the heart of the Lake District is Great Gable. 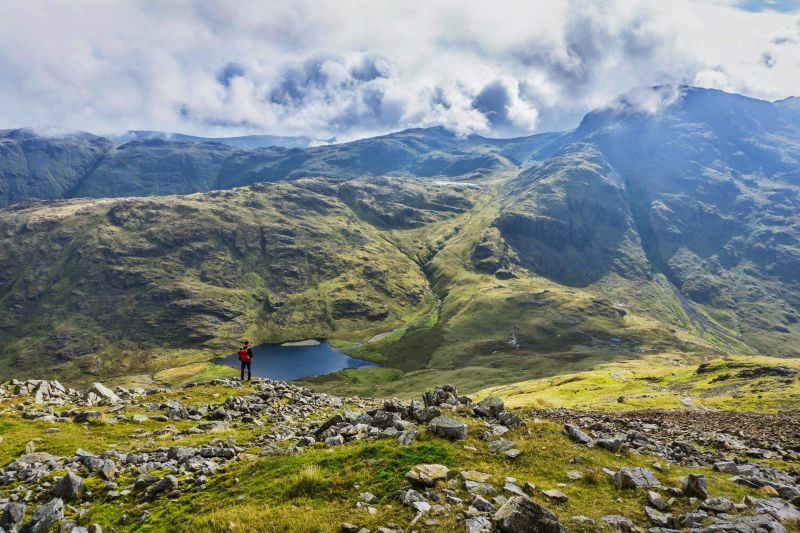 The mountain measures a humble 899m tall, but what it may lack in size, it certainly doesn’t lack when it comes to breathtaking views, which is why its earned its place on our best hikes in the Lake District list. The most popular way to walk this mountain is from Borrowdale, which is approximately a 12-mile route that will take average hikers around seven to eight hours to complete. 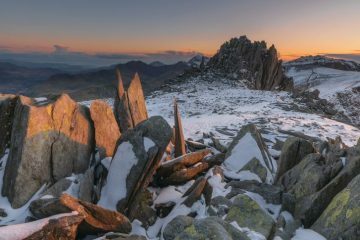 From the summit, you can expect dramatic views that stretch all the way out to Scafell Pike and often, fluffy low level clouds weave in and out of the surrounding valleys and mountains to create an atmospheric scene. If you fancy staying at sea level, then you certainly won’t regret heading to Buttermere. Measuring just over a mile long, this beautiful lake is framed by the gorgeous mountainous landscape that surrounds it, and is well-known to be one of the best lakes to walk around in the area. In fact, you’ll be blown-away by just how charming the views are from all of its different angles, edges and curves. The path around the lake is approximately four miles long and takes average hikers around three hours to complete. The surrounding valley is worth exploring too, so if you fancy making a day out of it, why not head into the hills? 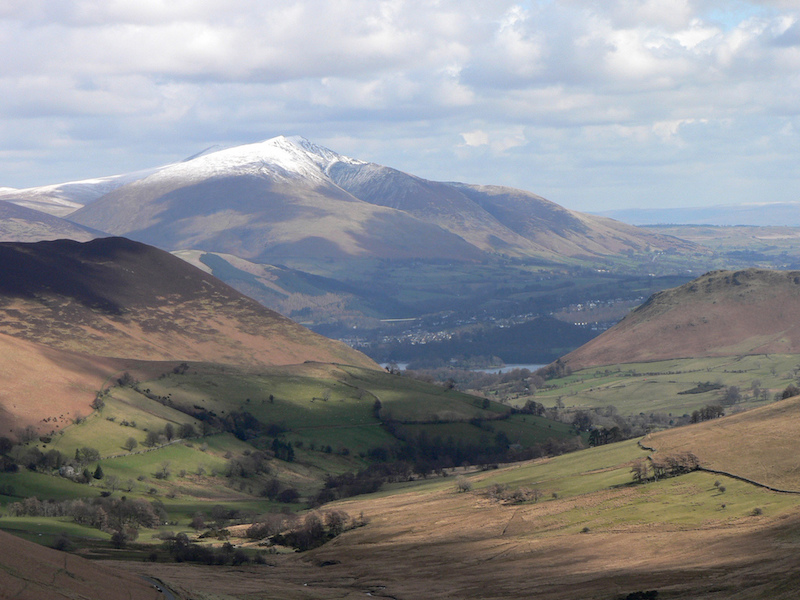 Set in the northern part of the Lake District, near to the town of Keswick, stands the impressive mountain Blencathra. This mountain measures 868m and the most exciting way to scale it is to ascend via Sharp Edge. The latter is an incredible knife-edge ridge that doesn’t require any technical scrambling or ropes, but it still offers a challenge, that extra little bit of spice to your route and can be daringly thrilling in some parts. 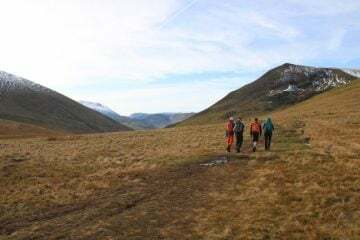 This hike starts from near Scales Farm in the village of Scales (many find it easier to park on one of the lay-bys on the A66) and is approximately eight miles long. Expect vast, sweeping views from the summit that will take your breath away – you certainly won’t want to forget your camera for this one. 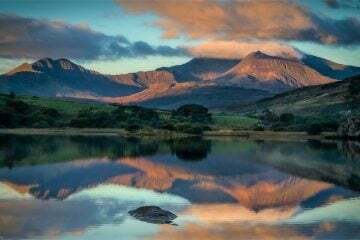 Without a doubt, you have to hike England’s highest mountain at some point in your life – Scafell Pike (977m). 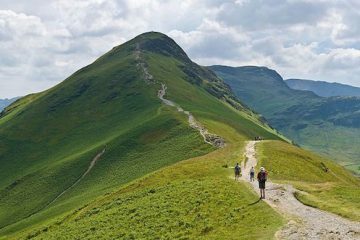 We think it’s a must-have for the best walks in the Lake District bucket list and is also a very rewarding walk that has stunning views on offer. As you would expect for a mountain that dons the highest mountain in England title, the most popular trails to the summit can be a bit of a motorway on a nice, sunny day. However, an alternative route that may beat the crowds is known as the Corridor Route, which begins in Seathwaite, in the north-west of Borrowdale valley. This route is approximately nine miles long, and offers some sections of grade one scrambling, which adds a little more excitement to the day. From the top, you can enjoy the sweet feeling of reaching the roof of England and the views are just as good. If you’re anything like us, you love the thrill of hiking a mountain via a ridge route. 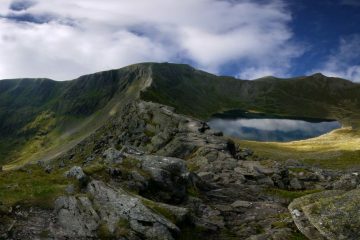 So, you’ll be pleased to know that Helvellyn (950m) offers just that in the form of Striding Edge. This exciting ridge walk is probably one of the most popular in England, so you will have to be prepared for some mountain traffic in peak summer months. This route starts in the village of Glenridding, is approximately eight miles long and will probably take average hikers around five to six hours. 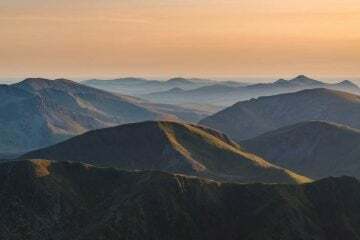 From the summit of Helvellyn, which is England’s third highest mountain, you can enjoy blissful views that (on a clear day) have been known to stretch all the way out from Scotland to Wales – impressive! 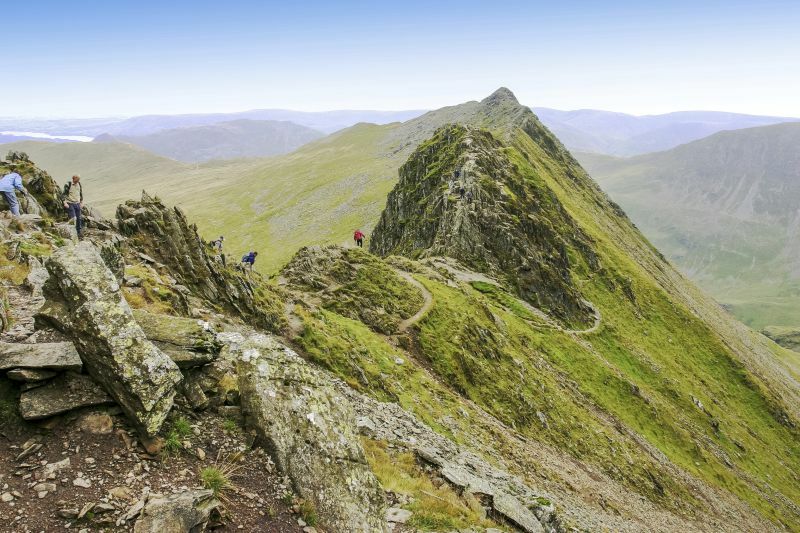 Fancy taking on one of the best walks in the Lake District? If you’re heading out on a day hike to tackle one of the best walks in the Lake District, you’ll need somewhere to stash all of your walking essentials in order to keep yourself fuelled and equipped for the adventure ahead. 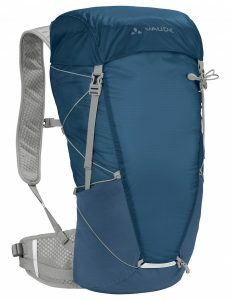 Being one of the lightest hiking backpacks with a ventilated mesh back on the market, the new Citus 24L back pack from Vaude is the perfect companion for any Lake District day hike. 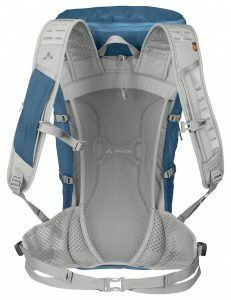 Not only this, but the Citus 24L also offers an abundance of other impressive features, such as lightweight shoulder and hip belts, reflective elements, and a compression cord system which is easy to use on the go. The backpack also falls under Vaude’s guarantee for environmentally friendly products, which means it’s been made from sustainable materials, has resource-efficient manufacturing and a fair production – this certainly gets the green tick from us! To find out more about the Citus 24L back pack or to browse the brand’s full range of quality outdoor clothing, gear and equipment, head over to the Vaude website.